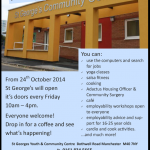 As part of the HAPPY Families programme, From Friday 24th St George’s will be opening it’s doors every Friday for people to pop in for a coffee and chat. The Centre is open to any age and any member of the community. Through the day we will have a Yoga class and Salsa sessions taking place.Computers can be accessed for web search or job searches with staff on board to assist and a play corner for parents to bring their children. Adactus Housing Officer will run surgeries once a month for any housing needs and Adactus Community Workers are on hand through the day. Or you may just fancy a coffee and cake and a good old chat whilst enjoying the Latin American music as the Salsa class gets underway.